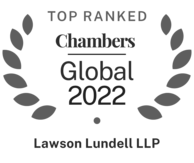 Lawson Lundell has offices in Vancouver, Calgary, Yellowknife and Kelowna. We are a full-service regional firm with a well-established, loyal client base. Our Vancouver office is the largest office and the base of operations for our articling program. Vancouver is a growing, dynamic city which offers excellent, high-quality legal work opportunities, while at the same time allowing its citizens to take full advantage of many recreational opportunities in a beautiful setting amidst the mountains and the sea. Our program includes the Professional Legal Training Course (PLTC) required by the Law Society of BC (during which students are absent from the firm while attending the program), as well as the 42-week rotation through our main practice groups. Students may begin the program at flexible start dates during the year, in consultation with the Manager of Student Programs to ensure that there are enough students at the firm at any given time. Students usually begin articles directly after graduation, in May, or after the summer, in September. Once students have arrived at the firm, they begin with training to teach them about the firm, our expectations, and our systems, including our technology and our library. Sessions are offered beginning in May, September and February of a given year. We consult with our students to come up with a mutually-agreed upon session (subject to availability of spots at PLTC) which accommodates our students' plans, such as travelling after graduation, and our own need to balance how many students are in the firm at a given time. More information on PLTC and articling generally can be found on the Law Society of BC's website. Many of our students are fortunate to be chosen to clerk at various courts in Canada. We encourage and accommodate this experience. Clerks receive priority for PLTC sessions. We pay clerks as first year associates once they have received their grants of licence. These practice areas correspond roughly to the four floors of the firm, and students change offices for each rotation to allow them to get to know staff and lawyers on each floor. During each rotation, students receive work directly from lawyers in those practice areas and are encouraged to take the initiative to seek work in areas of their own interest. Work is not allocated through a central person. However, we do hold monthly student meetings in order to check that work is being allocated fairly and to ensure that students have the opportunity to be involved in work that interests them. Students may take up to 10 days of vacation during the 52-week articling term. We consider students to be very important to the future of Lawson Lundell. We have a long tradition of looking to our students as the primary source of talent for future associates and partners. Just as you want to choose the right firm, we want to choose the right students for the long term. During our interview process, students will meet with small groups of our lawyers at every level of practice, as well as have the opportunity to interact with a larger group. We strive to get to know our potential students in more than one setting to ensure a selection process that is fair and thorough for both ourselves and for our candidates. We want to hire a mix of students from various schools and backgrounds: there is no one "type" of Lawson Lundell student. We are committed to providing and supporting ongoing educational programs. We encourage each student and lawyer to develop their professional skills to the highest degree possible. We are constantly working to strengthen our professional development program. We have a Director, Professional Development as well as a Professional Development Committee to review and enhance our programs. All of our students are assigned offices which change with each rotation. Each student has a PC equipped with Internet and research data bases in his or her own office. We have an excellent IT department available to deal with technology issues that arise. We have a comprehensive library staffed with helpful professionals who continuously support and train students in research matters and resources, including business and legal databases. We also have several dedicated research lawyers who are an invaluable resource to our students. Our Manager of Student Programs, Priscilla Chong, will assist in planning each student's articles as well as assist in developing or providing resources tailored to needs as they arise. Our Associate and Student Coordinator, Cindy de Graauw, will guide students through paperwork needed for the articling process as well as assist in scheduling rotations and assigning offices. Each student is articled to a principal. A principal is a senior lawyer who holds the general responsibility of ensuring that the articling requirements of the Law Society of BC are met. Principals meet with students periodically during the articling year to make sure students are getting the most from their articling experience. A principal can also act as an informal mentor to a student. Our students are assigned one-on-one formal mentors from our associate ranks. Most mentors are still quite junior and can remember their own experiences as students very clearly. They are often associates who enjoy being involved in student recruitment. Mentors come from various practice groups, and we make an effort to pair up people who will have interests in common. Mentors take their mentees to lunches, coffees and other events on an individual basis. In recent years, we have also had group events such as a bowling night or watching baseball at Nat Bailey stadium. The mentoring relationship is confidential, and mentees are encouraged to ask all the questions they want in order to learn more about the firm and the work we do. In addition to formal mentorship, students also find that as they move through their rotations within the firm, they develop informal mentoring relationships with various lawyers. Summer students retain the same mentor when they return as articling students. When a student becomes an associate, we assign a more senior associate or a partner to become the new associate’s formal mentor, but we encourage the previous mentor to continue to be involved in the new associate’s development. We constantly receive feedback from our associates that they enjoy the experience of learning to be mentors themselves through their involvement with students. Our hope is that by being involved in dual roles of mentor and mentee early in their careers, our associates will develop lifelong mentoring skills that forge strong bonds with their colleagues in the firm. 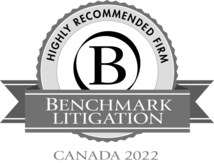 In addition, articling students receive two formal reviews – one at the mid-way point in their year and one near the end of their articles. The review considers the students legal skills, practice management skills, and communication skills. The Manager of Student Programs meets with each student individually to discuss progress and to determine areas of development to target. Students are also welcome to set up a meeting of this kind at any time during the articling year if they wish to have further feedback on their progress. We hold various social events during the year. While attendance is encouraged, we do not expect everyone to attend all events unless he or she wishes to do so. We have an annual winter holiday party, firm dinners, golf tournaments, a semi-annual retreat and ad hoc sporting events. Every summer the students and the lawyers square off against each other in a friendly soccer match. Students have a monthly lunch on the firm at a restaurant of their choice and often enjoy student breakfasts together. We participate in community events such as fundraising for the United Way, the Steve Nash Foundation, and the 24-hour relay. We encourage everyone to take part in social, athletic and community activities both within the firm and outside it. We hire only as many students as we are prepared to keep on as associates. In recent years, we hired approximately 10 articling students and approximately 10 summer students. We have a policy of moderate, controlled growth. Because of the stability of our client base and our success in developing new clients, we expect this pattern of growth to continue. In recent years we have hired back most of our students. Hire-back decisions are made based on the input of all lawyers in the firm. We thrive to keep students who are a good "fit" within our firm over the long-term, rather than focus too narrowly on how busy we are at the time of the hire-back decision. We attempt to communicate decisions to students at least two months before the end of a student's articles. What can I expect in terms of salary and benefits? Our articling salary is competitive with the other highest-paying major law firms in Vancouver. Summer students are paid the same as articling students. We pay all of the PLTC tuition fees as well as paying the student's salary while they are in the PLTC program. Students are entitled to medical, dental, and extended health care benefits. We will contribute $300 towards health club membership fees. Summer students receive a tuition and book allowance of $6,500 in addition to their summer salaries. We encourage involvement with the Vancouver legal community. We pay the annual fees for our students to join the Canadian Bar Association (CBA) and the Vancouver Bar Association (VBA), as well as a variety of other expenses, such as CBA section meetings and professional dinners. Applications are usually due in June following second year for articling positions, with articling interview week in August. More specific timing can be found on the Vancouver Bar Association's website. Is there a summer student program? 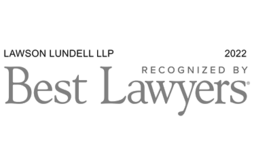 In addition to our articling program, the Vancouver office of Lawson Lundell offers a summer program for students who have completed their second year of law school at a Canadian law school. Our summer program is an important part of our recruiting process, and every year we anticipate that our summer students will return to article with us after they finish law school. Currently, we do not have a summer program in our Yellowknife office. Applications are usually due in September of the start of the second year of law, with interview week taking place in October. More specific guidelines and timing can be found on the Vancouver Bar Association's website. Is it different than articling? Summer students are treated just like articling students, except that we do not rotate summer students through different practice areas. We may assign students to a particular practice area for the summer months, in consultation with the student. Some students prefer to be placed in an area of interest to them, while other students want to challenge themselves by being placed in an area in which they have had less experience. Some students are still uncertain as to where they would like to be and in that case we can assist with the decision. The goal is for summer students to have an in-depth work experience in the summer. Prospective summer students often ask what sort of work they can expect to be doing during the summer months. Summer students have a chance to do the same work as articling students. They may be asked to assist in preparing for trial or a hearing in our litigation department. They may be organizing and preparing documents or performing due diligence on companies to assist on a corporate deal. Summer students are often asked to do longer, in-depth projects, as well as to assist in writing papers or preparing for presentations. The focus for our summer students is not on billable hour targets but on meaningful work which exposes them to an interesting practice area. We recognize that our students have unique skills and backgrounds and we attempt to help find projects which will make the best use of their skills. For example, we recently had a student interested in environmental issues who was able to contribute to our new Climate Change Group's newsletter during the summer months. We also understand that summer students are at the firm to fully participate in our firm's culture and professional development opportunities. Summer students can attend all of our in-house seminars for lawyers, as well as all social events such as the lawyer/student soccer game. We also have a series of lunch-time seminars just for our summer students where a lawyer from a specialized practice area speaks about that particular area. We invite our summer students to keep in touch with us during their third year of school, and if students are in town, we invite them to attend student lunches and firm social events. Our summer students are wonderful contacts at the law schools for prospective students. We encourage prospective students to speak with our students about their summer experience. Our Recruitment Committee is dedicated to recruiting excellent students and to ensuring that the student experience at Lawson Lundell is a good one. We meet regularly throughout the year to discuss issues that involve students and to maintain our ties with the law school community. We are active in sponsoring school events, such as a Law Games team, orientation activities and a hockey tournament. We also sponsor various law journals. We send speakers to the law schools on a regular basis and we participate in on-campus interviews and career fairs. Our aim is to meet and support students from all Canadian law schools. All recruitment committee members are happy to speak with students by phone or by email. Often we are able to set up a coffee meeting or a firm tour for interested students. We can also arrange for a student to speak with a lawyer or student in a practice area of interest to the student. We comply with the Vancouver Bar Association guidelines for both the articling and summer student hiring process. Please check the VBA website for exact dates. Articles: Applications for articles are due in the summer following completion of the second year of law school. In 2018, the deadline for applications is June 29; students who are granted an interview will be called on Call Day, July 13. Interviews will be held during the week of August 13th. Students should include a brief cover letter, a resume, and copies of both undergraduate and law school transcripts. Reference letters are always welcomed but not necessary. Applications should be addressed to the attention of Priscilla Chong and submitted via viDesktop. Summer Articles: Applications are due in the early fall after completion of first year law school, just as students begin their second year. In 2018, the deadline for applications is September 5; students who are granted an interview will be called on Call Day, October 4. Interviews will be held during the week of October 15th. Students should include a brief cover letter, a resume, and copies of both undergraduate and law school transcripts. Reference letters are always welcomed but not necessary. Applications should be addressed to the attention of Priscilla Chong and submitted via viDesktop. We will acknowledge all applications we receive. Contact our Student Coordinator, should you have any questions about the firm or the application process. We participate in on-campus interviews (OCIs) at various law schools each fall. Once we select applicants for interviews in the OCI process, we will follow each law school's process for notifying applicants (some schools notify students for us, and other schools ask us to notify students directly – please check with your Career Placement Office should you have any questions). After the OCIs, we will be in contact with you on Call Day if granted an interview: if you are not granted an interview you will receive a letter letting you know that no interview has been granted. If there are no OCIs at your school, after the acknowledgement letter you will either hear from us on Call Day to set up an interview, or you will receive a letter saying that no interview has been granted. After acknowledgment of your application, you will either hear from us on Call Day if an interview has been granted or you will receive a letter saying that no interview has been granted. We send Intent to Call e-mails to students who have been selected for an In-Firm Interview. On Call Day we may invite you for a lunch or dinner with lawyers at the firm during interview week. All of our interviewing students are invited to a reception the Monday night of interview week at our firm and we encourage you to attend for part of the time, even if you have other obligations as well on that evening which require you to leave early or come late. We schedule interviews Monday and Tuesday of interview week – because of the new Call Day and Offer Day system, it no longer matters if you have your first interview early Monday morning. There will be enough time before the Offer Day to meet other lawyers if need be, so please do not worry about the timing of the interview. At the firm you will usually meet with two of our lawyers for your interview, one of whom will be on the Recruitment Committee. We will provide your interviewers' names to you in advance of the meeting. You will also meet one of our current students after the interview for a brief firm tour. We encourage you to ask questions, to relax and to be yourself in the interview: if you have been asked to interview with us, it is because we have a genuine interest in you. Be confident in your abilities and be prepared to talk about your experiences. We do not make offers or give indications that we will make offers until 8:00am PST on the Thursday morning of interview week, in accordance with the VBA guidelines. Once our offers have been accepted, we will contact all of our interviewing students to advise them that our process is complete.